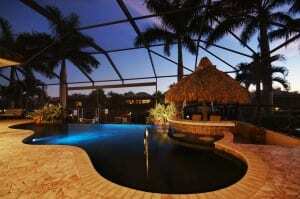 But that’s taking the pool and conditions up north and moving it to the Southwest Florida pool home. Up north, there are no screen enclosures (for the obvious reason… the weight of snow), and hence lots of leaves and dirt in the pool that needs to be cleaned on a regular basis. And to state the obvious, we don’t have freezes, so there is no annual draining of the pool. The screen enclosure, sometimes called a “pool cage” usually covers the entire back of the home’s pool and patio, or lanai, area. Not only does this keep dirt and palm fronds out of the pool, it makes for an indoor-outdoor living space. In Southwest Florida, we open up all the windows and doors in the winter. The screen enclosure keeps out the mosquitoes and no-see-ums. On a 60 degree night, it’s nirvana for sleeping: a nice cool Gulf water breeze throughout the home. 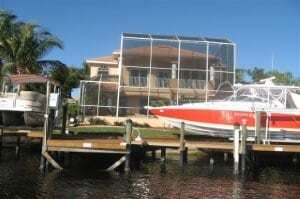 Pictured at the top is a two story home in Cape Coral with the screen enclosure covering both stories. The Master suite is upstairs and they can open up to enjoy the breeze. At first, a person might think, “I don’t want to look through that screen thingy,” and we’ve heard that many times. But after visiting three or four homes with pool enclosures, it disappears. Literally, people forgettaboutit. Update: As one of our friends pointed out, also less grass to mow!